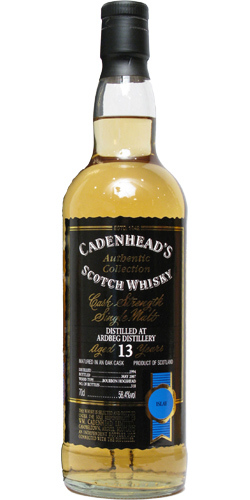 Here’s a little treat from Cadenhead’s… A peaty teenager from Islay. The 1994 vintage Ardbeg, aged for 13 years in a Bourbon barrel and bottled at cask strength. Noteworthy because it was distilled while the distillery was owned by Hiram Walker. Glenmorangie bought Ardbeg in 1997, and their standard releases (except for Ardbeg 10) are typically now released without an age statement. Old Ardbeg tends to sell for a premium, so it’s nice to a) try spirit older than 10 years, and b) have a go with a bottling from the old regime. Nose: Coal, rock dust, rubber, dense oily smoke, sticking plasters, dried salt, pine resin. Palate: Oily malt biscuit, brine, swiftly evolves into dry smoke, tea, liquorice, grapefruit, cloves, and pepper. Little floral/herbal notes of violet and lavender. Finish: Citrus, Brazil nuts, and dry smoke. I do like the modern Ardbeg expressions, but this is different – very mineral-rich, and more savoury and drying than the 10 year old, with subtle nuances (I think cask strength probably helps here…). I also reckon the lack of wine-cask means more flavour’s drawn from the barley and the oak. I’m not sure if the Bourbon cask was a first-fill or not but I don’t get the typical whiff of vanilla, or the sweet spice. So I’m tempted to suggest the flavour comes from good spirit, good distillation, and good oak. Nose: Barley grass, definitely vanilla, coal tar smoke in evidence, tarred-rope and maritime/fish notes. Palate: Sweet vanilla, tangy smoke, citrus fruits, cloves. Not as drying as the older Ardbeg. Finish: Peppery, with a charred oak flavour and salted cashews. It’s good, of course – Ardbeg 10 is one of those Islay staple drams that’s consistently good quality. I think there’s a first-fill Bourbon influence – I get less barley flavour and more vanilla sugar. Also, the smoke is still coal-tar in nature but it’s less pronounced, and not as drying and the mineral notes are more in evidence as maritime/coastal scents. It’s probably more in keeping with an older style of whisky production, which definitely gives it a big appeal. Modern whisky is often accused of being too heavily groomed and doctored to fit certain profiles that keep the market researchers happy. Either way, it’s a pleasure to drink both of them. And I’ll be keeping an eye out for more old Ardbeg, provided it isn’t attached to a daft price tag. I got my Ardbeg 1994 sample on WhiskySample.nl, but they’re all gone now. Keep an eye out on auction sites for older Ardbeg – you might get lucky with a sane price.